Expedia has some Argentiere travel packages waiting for you. Bundling your accommodations and airfares is one of the simplest ways to save money on your upcoming trip. Gain savings up to 59%* when you book your package deal on Expedia. Click through our international database of more than 400 partner airlines and 321,000 properties worldwide. Too many to choose from? Don't stress — we'll help you decide! It can be enjoyable to just roam the streets when you're in a new place, but sometimes it's a good idea to form a plan. Grab your schedule — we have some cool ideas for your Argentiere holiday. If you're the kind of traveller who enjoys filling their days with sightseeing, you'll fall in love with this place. Say yes to new adventures at Sea of Ice and Planards Adventure Park. If you get dizzy at the mere mention of heights, a ride at Aiguille du Midi Cable Car is a superb opportunity to overcome your fear. Sit safe and snug inside the wagon while the fabulous views take your mind off your nerves! There's a wonderful range of things to do in and around this destination. Many have said that knowledge is power. With that in mind, you'll definitely feel more powerful after spending an afternoon at Chamonix Alpine Museum. Still have time to spare? Wouldn't mind adding some greater meaning to your holiday? Make a pilgrimage to Chamonix Church. No matter your beliefs, it's a terrific place to observe and learn about the local faith. Argentiere has 42 conveniently located properties, so why hesitate? Select your perfect accommodations for your next luxury getaway or cheap holiday with a little help from Expedia. Argentiere's more upmarket choices such as the Le Hameau Albert 1er (38 Route Du Bouchet) and the Grand Hôtel Des Alpes (75 Rue du Docteur Paccard) are bound to charm the most discerning guests. Alternatively, the Les Ecrins de Soulane (73 Avenue Ravanel Le Rouge) and the Les Rives d'Argentière (162, Chemin des Vélars) are a couple of accommodations well worth investigating if you're a bit more budget conscious. We know the airport won't be the most memorable part of your holiday, but there's nothing like the excitement of knowing that your well-earned trip to Argentiere is a mere plane ride away! Once the wheels hit the ground at Cointrin International Airport (GVA), you'll be 45 miles (72 km) from the centre of town. 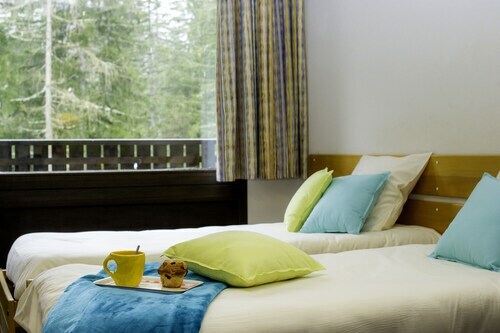 Situated in Chamonix-Mont-Blanc, this hotel is 0.1 mi (0.1 km) from Les Grands Montets Ski Area and within 3 miles (5 km) of Domaine de Balme Ski Area and Grands Montets Tramway. Lac Blanc and Brevent-Flegere Ski Area are also within 6 miles (10 km). Chamonix-Mont-Blanc Argentiere Station is only a 3-minute walk and Chamonix-Mont-Blanc Montroc-le-Planet Station is 25 minutes. 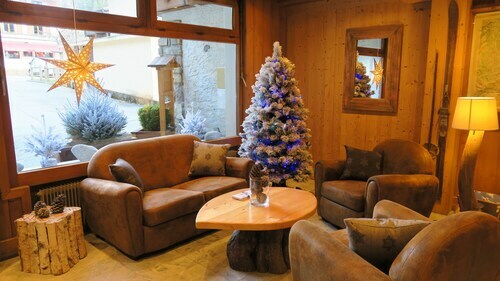 Situated in the mountains, this hotel is 0.1 mi (0.1 km) from Les Grands Montets Ski Area and within 3 miles (5 km) of Domaine de Balme Ski Area and Grands Montets Tramway. Lac Blanc and Brevent-Flegere Ski Area are also within 6 miles (10 km). Chamonix-Mont-Blanc Argentiere Station is only a 2-minute walk and Chamonix-Mont-Blanc Montroc-le-Planet Station is 25 minutes. 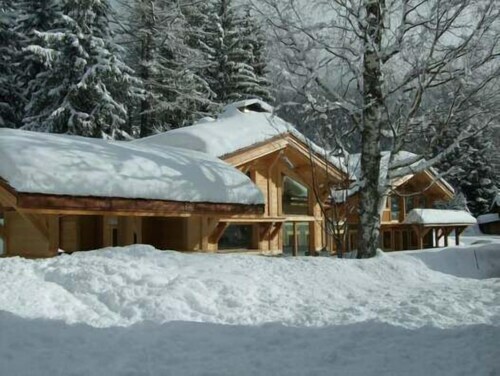 Conveniently located near the ski slopes, this Chamonix-Mont-Blanc residence is situated in the mountains, within 2 miles (3 km) of Les Grands Montets Ski Area and Domaine de Balme Ski Area, and is convenient for winter sports, such as cross-country skiing and skiing lessons. Grands Montets Tramway is 2.3 mi (3.7 km) away. Chamonix-Mont-Blanc Argentiere Station is only a 2-minute walk and Chamonix-Mont-Blanc Montroc-le-Planet Station is 28 minutes. Conveniently near to skiing facilities, this Chamonix-Mont-Blanc chalet is located in the mountains within 3 miles (5 km) of Les Grands Montets Ski Area, Domaine de Balme Ski Area and Grands Montets Tramway. Brevent-Flegere Ski Area and Flegere Cable Car are also within 6 miles (10 km). Chamonix-Mont-Blanc Argentiere Station is only a 3-minute walk and Chamonix-Mont-Blanc Montroc-le-Planet Station is 27 minutes. 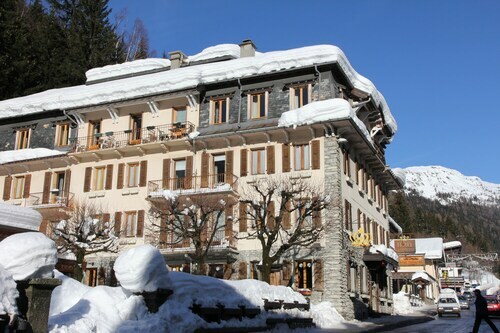 Conveniently near to skiing facilities, this Chamonix-Mont-Blanc residence is located in the mountains within 3 miles (5 km) of Les Grands Montets Ski Area, Domaine de Balme Ski Area and Grands Montets Tramway. Brevent-Flegere Ski Area and Flegere Cable Car are also within 6 miles (10 km). Chamonix-Mont-Blanc Argentiere Station is 6 minutes by foot. 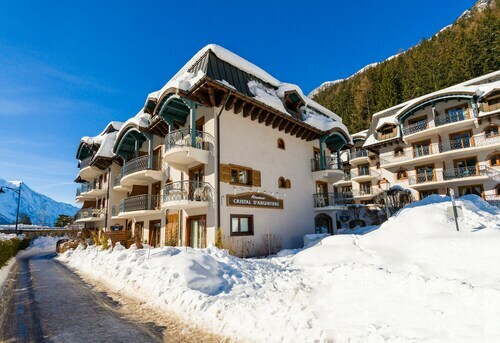 Located in the mountains, this slopeside Chamonix-Mont-Blanc apartment building offers ski-in/ski-out access within 2 miles (3 km) of Les Grands Montets Ski Area and Domaine de Balme Ski Area, and is convenient for winter activities, such as skiing lessons. Grands Montets Tramway is 2.5 mi (4 km) away. Chamonix-Mont-Blanc Argentiere Station is only a 4-minute walk and Chamonix-Mont-Blanc Montroc-le-Planet Station is 28 minutes. 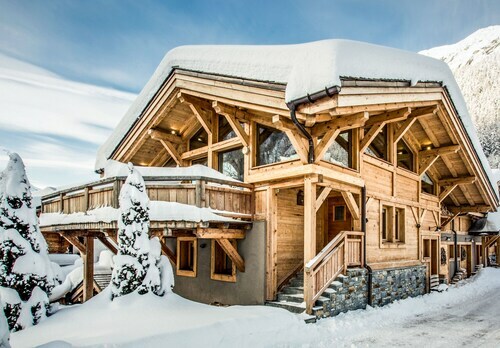 Situated in the mountains, this chalet is 0.1 mi (0.1 km) from Les Grands Montets Ski Area and within 3 miles (5 km) of Domaine de Balme Ski Area and Grands Montets Tramway. Lac Blanc and Brevent-Flegere Ski Area are also within 6 miles (10 km). Chamonix-Mont-Blanc Argentiere Station is only a 3-minute walk and Chamonix-Mont-Blanc Montroc-le-Planet Station is 27 minutes. 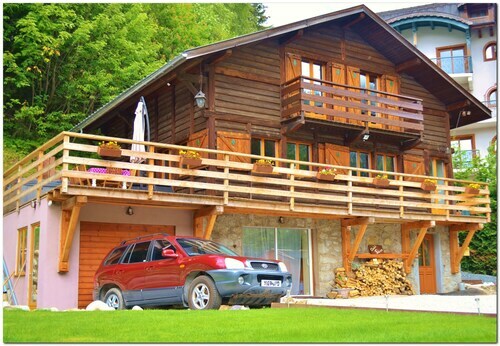 Situated in Chamonix-Mont-Blanc, this chalet is 0.1 mi (0.1 km) from Les Grands Montets Ski Area and within 3 miles (5 km) of Domaine de Balme Ski Area and Grands Montets Tramway. Lac Blanc and Brevent-Flegere Ski Area are also within 6 miles (10 km). Chamonix-Mont-Blanc Argentiere Station is only a 2-minute walk and Chamonix-Mont-Blanc Montroc-le-Planet Station is 30 minutes.